Install Telesleeve in approximately 20 minutes with normal hand tools. Traditional sleeve "wrecking" with Plywood and foam approximately 1.5 hours per location. Galvanized 16 GA Steel "Stay-In-Place" Design eliminates wrecking costs. Plywood and foam difficult with modular steel deck and beam forming systems. Telesleeve designed specifically for modular steel systems. Simple design is also easy to incorporate into traditional wood forming systems. Telescoping design accommodates multiple beam widths. 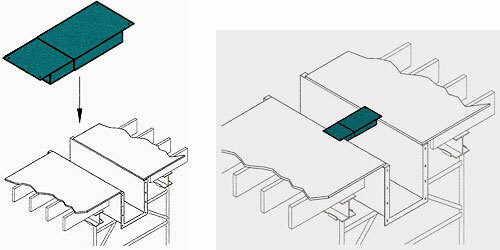 Telescoping design also accommodates beam form "spread" during concrete placement. Simply place TelesleeveTM in desired location and secure to deck formwork via (2) 5/16 diameter holes provided in each support tab (fasteners not included).